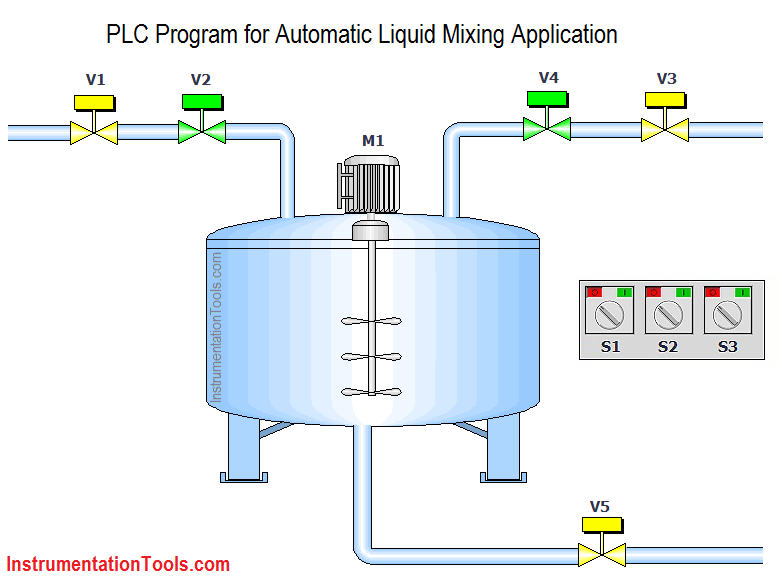 This is PLC Program for Automatic Liquid mixing Application. In many industries, there are lots of mixing system are used for solutions mixing. Some plants use complete automation or semi-automation. In manual system, there are so many disadvantages such as lack of Accuracy, Time delay problem, loss of liquids, Time consuming etc. Here we are discussing semi-automatic application of mixing system. For this example, we use PLC programming and for that we use Siemens S7-1200 PLC. For easy explanation, we can consider simple example of mixing system as shown above. In this application pure unmixed solution can be prepared by the operator using switches S1 and S2. And mixed solution or material can be prepared by the operator using switch S3. Operator observes the level of the tank and he can discharge the liquid inside tank by operating valve V5. Also the agitator motor M will be in running while tank is being filled. We will provide interlock system so operator cannot operate both switches at same time. V1, V3 and V5 are manual valves which is not connected to the PLC. V2 and V4 are electronically operated valves which can be controlled by PLC. For this application, we used S7-1200 PLC and TIA portal software for programming. In Network 1, we have taken NO contact of S1 (I0.0) and NC contact of S2 (I0.1) and S3 (I0.2) in series. By activating switch S1 operator can START the valve V2 for solution 1 (Liquid 1 ). In Network 2, we have taken NO contact of S2 (I0.1) and NC contact of S1 (I0.0) and S3 (I0.2) in series. 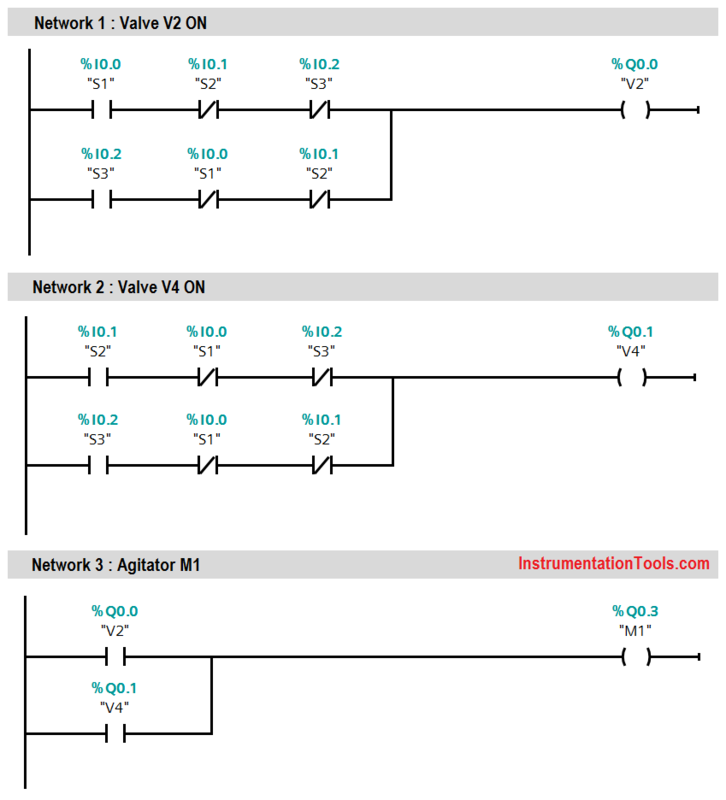 By activating switch S2 (I0.1) operator can START the valve V4 (Q0.1) for solution 2 (Liquid 2). For both Networks 1 & 2, A parallel connection we have taken, NO contact of S3 (I0.2) and in series with NC contact of S1 (I0.0) and S2 (I0.1). As per our condition, agitator M1 (Q0.2) should be activated automatically while tank is being filled. So we have taken NO contact of V2 (Q0.1) and in parallel NO contact of V4 (Q0.1) so agitator will be activated automatically by operating any switch. Note : The above PLC Logic provided for basic idea about application of PLC in Liquid Mixing Application. The Logic is limited and not complete application. @2019 - Reproduction without explicit permission is prohibited.